I watched Interstellar and came out deeply disappointed. Since then, I’ve read many other reviews, of both the science and the filmmaking, and I keep thinking maybe I’m being too hard on the film. Yeah, some of the science was bad. A lot of movies have bad science, and this one also had a lot of really good science. And it’s just a movie! So maybe I should give it a pass. Maybe I should say, “It did a really great job explaining relativity!” (which it did) and leave it at that. But I can’t. For one thing, this film was hyped like crazy for its supposedly accurate science. It was compared with 2001, which really did have great science (excluding the stuff about weirdly supernatural alien powers because you really do have to give that a pass if you want to enjoy science fiction at all). And it was promoted to the physics community as if it would be our one chance to watch a film and be blown away by its fidelity to physical law. Even worse than the scientific failings, though, is that it misrepresented how science is done. And when I see that, I start to get a lot less charitable. In any case, I now have an excuse to tell you some true and totally mind-bending things about relativity and black holes, and who could resist that? 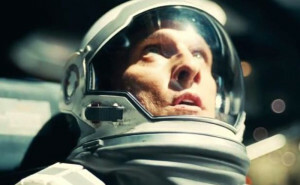 All you need to know about the non-scientific aspects of Interstellar’s plot, for the purpose of this review, is that Matthew McConaughey plays a pilot-turned-farmer named Cooper, and he’s recruited to go into space and save the world by (among others) a physicist named Professor Brand (Michael Caine). And somewhere out there he encounters a planet orbiting a really massive black hole. Even for a science fiction film, Interstellar contains a lot of science. It starts with ecology, agriculture, and atmospheric science. It touches on robotics and aeronautics. There’s orbital mechanics and planetary science and, of course, relativity. I’m not going to be able to talk about all of that, so I’ll stick with a couple examples dealing with the science I know: physics. The scientific topic that looms largest is general relativity, or GR. There are sort of two kinds of relativity. Specialrelativity was Einstein’s first big breakthrough in this area, and it all hinges on the idea that light can only travel at a constant speed (through a vacuum anyway), and that speed is the ultimate speed limit in the Universe. Starting from there you can (as Einstein did) derive that the passage of time is relative, and depends on how you’re moving. If you’re moving at a speed that’s close to the speed of light, your watch will tick much more slowly than the watch of someone who has waited at home. Special relativity was the first theory of space-time—the essential melding of space and time, and the idea that time is its own dimension, though one we can only travel through forward. General relativity is an extension of special relativity that includes gravity, and how it affects space-time. In GR, you can think of massive objects as bending the space-time in their vicinity. The more massive an object is, the more space-time curves around it, which is why planets orbit stars: they’re trying to go in a straight line, but they’re curved around by the distorted shape of the space they’re travelling through. GR also tells us that the way time passes is affected by space-time curvature. The closer you are to a massive object, the slower your time passes. This is called time dilation, and it’s a major plot point in Interstellar. It really is true that if you’re close to a black hole, your time will slow down, and the closer you are, the more extreme the dilation is. Theoretically, you could get close enough to a black hole for only hours to pass for you while decades pass on Earth. But there’s a really important thing about gravity that Interstellar leaves out which doesn’t depend on GR at all–it comes from long-standing ideas in classical physics, and as far as I can tell,* complicated GR effects don’t fix it. Let’s say you’re falling towards a black hole, feet first. The black hole has tremendous gravity, because it is both massive and compact—the defining feature of black holes in general. When you’re falling toward the black hole, your feet are just a little bit closer to the hole than your head is, and that means they feel a stronger gravitational pull, and it stretches you out. This is true on Earth as well, but since Earth isn’t all that massive, and you’re not very close to the center of mass, it has a negligible effect. For a black hole, this head-to-toe gravitational discrepancy, called a tidal force, is not negligible anymore. Tidal forces are responsible for an effect known in physics as “spaghettification”—the technical term for objects (or astronauts) being stretched into thin spaghetti-like strands. The second time tidal forces should come up is when someone goes into a black hole, beyond the event horizon, and is not even slightly spaghettified. There is nothing that could save a person or a spacecraft from tidal forces, and by the time you go past the event horizon, you’re not only lost forever, you’re also doomed to be stretched and crushed to oblivion. So you really shouldn’t try it. I could go on about other scientific inaccuracies, but I won’t – the spaghettification issue is the most egregious thing, and a lot of the others (like the weird orbital mechanics and various things to do with planets visited) have been covered in detail elsewhere. The thing that ultimately killed my suspension of disbelief the most was the movie’s depiction of how science is done. One of the key plot points has to do with Professor Brand’s attempt to solve “the gravity equation.” Brand claims that if only he can solve gravity, he can create a new kind of spacecraft and literally save the world. At some point he says that if he has a few years, he’ll sort it out. When I heard that, I had to stop myself from blurting out, “What, by yourself? !” In science, nobody does that. Physicists don’t work like that. We talk to each other. We read the literature. We compare notes and work in teams and divide up problems amongst ourselves. We don’t sit in a room with a blackboard and maybe one assistant and just think it out. The character who drags Cooper kicking and screaming into the space program to leave Earth and maybe never come back apparently can’t even manage to find a single PhD student to talk through his equations? I know this is the apocalyptic future, but even so, physicists can’t be totally extinct. I think the trope of the “lone genius scientist” is actually kind of damaging for the way science is understood by the public, so seeing this kind of depiction is a sore point for me. Anne Hathaway also plays a scientist in the film, but by the time I got to the point in the film when she starts hypothesizing that love is a dimension transcending space and time I had already given up on seeing an accurate portrayal of how scientists talk and think. Remember that this is a film that expects us to believe that Cooper—an engineer who certainly does not come off as un-curious—would have agreed to fly through a wormhole without asking even the most basic questions about relativity and spacetime before setting off. It means we get a nice explanation of wormholes with a folded piece of paper, but you’d think they could have done that back on the ground. I don’t know if I would recommend Interstellar. Some of the visuals are gorgeous, of course, and it legitimately rivals 2001 and Gravity in that regard. The spacecraft is depicted in a reasonably realistic way, as are a lot of little details about space travel. The spectacular visualizations of the black hole and wormhole are apparently based on such accurate physics that they are being written up for a scientific paper. I don’t think the scientific inaccuracies alone would be enough to make me not recommend the film, if I liked it for its plot, dialog, pacing, etc. Unfortunately I felt it failed on those criteria as well, which was a real disappointment for a film I wanted to love. It’s a visually impressive film with some very good explanations of general relativity. If you know nothing about the science of time and gravity, you probably will learn something, which is a statement I wouldn’t have expected to be able to make about any film. But you’ll learn nothing about how science is done, and if you do know a bit about space travel and planetary science you’ll probably end up more frustrated than enlightened. So, sure, go ahead and watch it, on the biggest screen you can find, but be prepared for some cringing. And keep in mind that it’s almost three hours long. The spaceship isn’t called “Endurance” for nothing. * It’s been claimed that some kind of complicated GR issue could possibly resolve this, but (a) I don’t see how, and (b) I have yet to be shown that GR corrections, should they exist, could change the answer by the necessary order(s) of magnitude. Since the planet is probably within the ergosphere, the shearing of spacetime probably makes the disruption happen even faster. ** In his first (now corrected) review, Phil Plait said you wouldn’t be able to get close enough to a black hole for the time dilation the film requires without being too close for a stable orbit. This is true for a non-rotating (Schwarzschild) black hole, but a rotating (Kerr) black hole can actually have stable orbits right on the edge of the event horizon. If we assume the black hole in the film is rotating very rapidly, the time dilation might be plausible, but the immunity to tidal forces is not. AstroKatie WorldSciFest “Fade To Black (Hole)”….Nice! dr_ikjyotsinghk AstroKatie WorldSciFest O oh! PHD fight! Fight fight fight fight fight fight fight fight fight fight fight fight fight!!! mugugipan That’s really not helpful. mugugipan Well I can block you if you like, or you can be civil. Up to you. AstroKatie read this today, really liked it! AstroKatie Wow! R u serious. I thought we were just goofin around. If you’re going to be a giant dork about it, goodbye! AstroKatie I’m avoiding yours and NDTyson’s (spoilery) critiques till after I’ve seen the film. But THEN I’ll read them! mugugipan Oh I’m the biggest dork. But mostly just out of patience after some of the comments I’ve had. All the best to you and goodbye. AstroKatie Good to know. I’ll pass on the film. Thanks. AstroKatie I appreciate your take on the film Katie. More (accurate) knowledge is never a bad thing. AstroKatie it’s been 20+ years since i took GR, but aren’t SMBH’s much less dense than BH’s and thus have less severe tides near the EH? te_pickering Yep. This one was apparently 100 million solar masses. Tides still enough to disrupt. AstroKatie so they had the right idea, but needed a BH a couple orders of magnitude bigger? te_pickering So yeah there are ways to make it OK but from the basic details given out it doesn’t work. AstroKatie WorldSciFest what would be a counter-example to bad science-movie couple? Do you know any example of good science-good movie? Esuntr WorldSciFest I don’t know any that were totally perfect. AstroKatie nb: we can indeed assume a Kerr BH; in the prep for the final slingshot they mention that Gargantua is rotating very fast. AstroKatie Took kids to interstellar, after movie kids raised quest. on gravity/wormholes/dilation/spacetime…Perfect movie for me! AstroKatie I like how you resisted the urge to rip into what happens *after* the person enters the black hole, which is what did me in. rossgrady I feel like at that point it was going into some beyond-physics-as-we-know-it territory. AstroKatie That plus those damn slabby robots. I mean, they were neat-looking, but not really top-100 robot form factor material. AstroKatie also, if the BH is rapidly rotating (as is the case in the movie) i’m sure you get funky ergospheric effects as well. te_pickering Yeah, I think the spacetime shearing is not going to be good. My son is a film maker, home schooled. I didn’t teach him quite enough physics so perhaps this review will get him interested again. Thanks Katie. The crew takeoff from earth with present day rockets that seem to have much difficulty escaping earth’s gravity. This should be the case with other planets right? But they seem to maneuver out of other planets with ease. No debris seem to make any dent on the spacecraft :( not even a bump on the frozen clouds! AstroKatie 4 movie scripts all mashed into one….if only i could get behind the library shelves of the script editor and change the past. I asked the film to entertain and absorb me. it did. I didn’t go to the moves to be in school at this point. @AstroKatie Esuntr WorldSciFest Even 2001: A Space Odyssey? We appreciate lively discourse and debate about the contents of our articles, but a few comments have crossed the line into personal attacks on the author, which are not acceptable. Any comments veering into ad hominem will be deleted under Rule 1 of our community guidelines. I have not seen the film, but sorry Katie, you are wrong about the spaghettification. The tidal acceleration at the horizon of a black hole is 1 gee per meter for a black hole of mass 2 x 10^4 suns, and the tidal acceleration decreases as mass^-2. If the BH mass is 100 million suns, then the tidal forces will NOT spaghettify you. It would be astonishing if Kip Thorne, executive producer of the movie, would have missed so elementary a fact. and string theory.Contrary to Dr.
One of the problems that I have with the film is that the team goes through a wormhole that shouldn’t exist, because it was created by humans from the future. In other words, the future humans didn’t exist before present-day humans, so the wormhole can’t exist. @KosmicKeith You have the same problem with the young daughter communicating with her father who was sending messages from the future. If you grant “Neophysicists” the assumption of time travel, then one can go forward and backward in time just as one can go forward and backward in space. That’s some of the nonsense you get when you combine space and time into spacetime, and you allow for relative time as derived from Special Relativity and General Relativity. Physics has left science and returned to meta-physics and mysticism. Terrible movie with science words but no real science. Bad as a movie except for the first half-hour on earth depicting climate change and sociological implications..
@AstroKatie With respect to Dr. Brand and how the way he does science is completely unlike how science is actually done, I think perhaps you might be overlooking the fact that the whole point was to say that Dr. Brand was not engaging in science in the first place. They say in the film that Dr. Brand had solved the equation “40 years before” or something like that. It would seem to me that for all we know he could have solved the problem before the environmental crisis occurred, or in other words, a time similar to ours in which scientists worked in teams and reviewed each others’ work thoroughly. The other possibility exists of course, in which Dr. Brand did simply solve a revolutionary equation all by himself as a “lone genius scientist”. My impression is that we simply do not know the circumstances in which the equation was truly solved, because this event occurred outside the plot line of the movie. Cooper mentions at one point Dr. Brand’s arrogance in thinking that he was the sole person to judge what was best for our species. To me this appears to be Nolan’s way of disapproving of what Dr. Brand did. When one takes into account the fact that the discovery of the solution to the gravitational equation occurred before the earliest event of the plot, I would think that would suggest that the last 40 years of Dr. Brand’s life (i.e. his lifetime during the plot of the movie) were not spent engaging in scientific research, but rather were spent trying to deceive everyone else so that they could go on a mission and achieve what he thought was best for our species. Cooper also argues that Dr. Brand and Dr. Mann should have tried to spend time focusing on saving the population of earth and he seems to argue that they had unnecessarily given up on saving the current living members of our species (since the artificial incubation “plan B” was “plan A” all along). To me this would suggest that Nolan was of the view the character Dr. Brand had wasted his scientific knowledge and intellect by trying to be the “lone genius scientist” or rather, going one step further, the last, best hope for humanity. It suggests a certain narcissism and egoism which has not been unheard of before in the scientific community (I’m thinking of Sir Fred Hoyle, who refused to accept the Big Bang theory up to his death because it disproved his steady state theory). I guess what I am trying to say, is that the way I interpreted it, Dr. Brand turned out to be one of the antagonists, or “bad” characters, and one which the audience was driven to disapprove of. So even if he fits the bill of the lone genius archetype 100%, my impression is that in this instance it does not seem to damage the way the public understands science due to the fact that viewers are supposed to dislike like both him and his methods anyway. Teach Your Robots Well: Will Self-taught Robots Be the End of Us? Nanotechnology’s Promise: A Big Risk in a Small Package? Is Alien ‘life’ Weirder Than We Imagine: Who Is Out There?